For the first time ever, secondary school students from Aberdeen got a chance to show their knowledge and share their love for all things brainy! On the 21st of February 2018, students from Robert Gordon’s College and St Margaret’s School for Girls met at the Aberdeen Science Centre to compete against each other in a neuroscience competition, the 1st Aberdeen Brain Bee. The day was filled with activities which tested students’ knowledge about the brain, its’ structures and functions, as well as different disorders that can affect it. 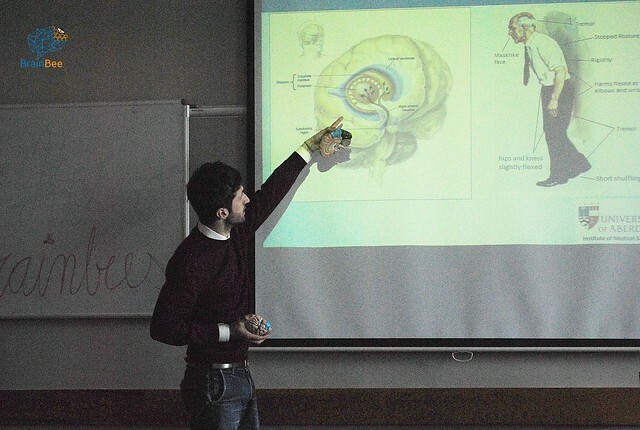 Students also got an insight into the life of a neuroscientist, as well as some of the most current and vital research, thanks to incredible guest speakers. The winners were Disha Nandish, Anish Subramaniam, and Hashim Iqbal, all from Robert Gordon’s College. Well-earned congratulations should go to all the winners but most notably Disha who managed to win first place being only 12 years old. The next step for the winners is the National round which will take place in April, 2018. The event was organised by the Aberdeen Brain Bee student volunteers, with a greatly appreciated help of staff and PhD students from the University of Aberdeen, as well as Aberdeen Science Centre. The Brain Bee is an international organisational which runs annual neuroscience competition for young people aged 14-19. The aim of the contest is to encourage young people to pursue their interest in neuroscience and give them a chance to interact with research in this area. The Brain Bee Aberdeen Hub has run the competition for the first time this year. We’re hoping to continue our mission of supporting young talents. The Aberdonian students have proven themselves to be extremely bright, passionate, and insightful and we wish them many more future successes – they surely deserve them!